Spaghetti squash is one of my new favorite meals in our rotation. We had it a few years ago in place of spaghetti noodles and then for some reason, didn’t eat it again for a long time. The last 6 months or so we’ve been having spaghetti squash on a regular basis. At least twice a month. Let rest until it is cool enough to handle, then shred in to a large bowl. Season with S&P and drizzle with olive oil. Top with your choice of cheese, and mix in so that cheese begins to melt (If squash isn’t hot anymore, just give it all a good turn in the microwave). Meanwhile, in a large pan coated with olive oil, saute garlic over medium-high heat for about 1 min stirring continuously. Add broccoli and saute for 3 mins stirring constantly, making sure not to burn garlic. 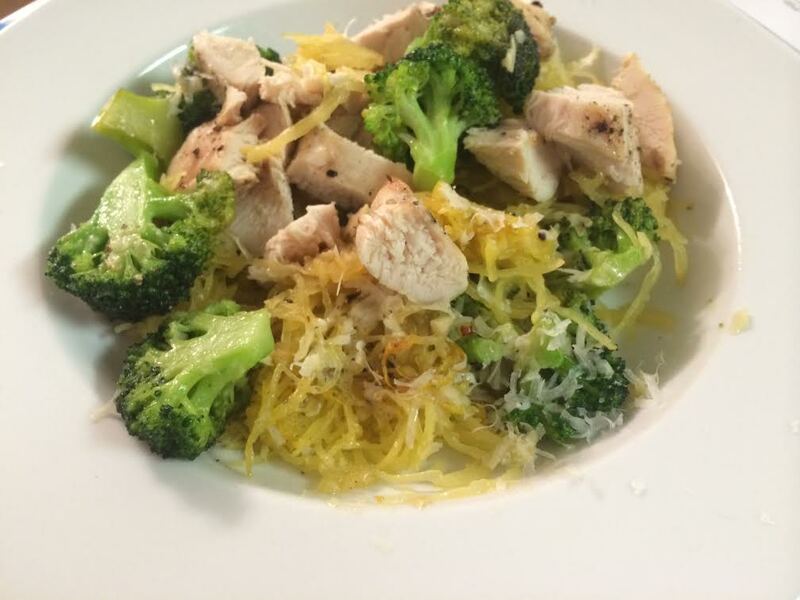 Serve broccoli over a bowl of the spaghetti squash and enjoy! It sounded amazing to me. I love garlic. The more the better. 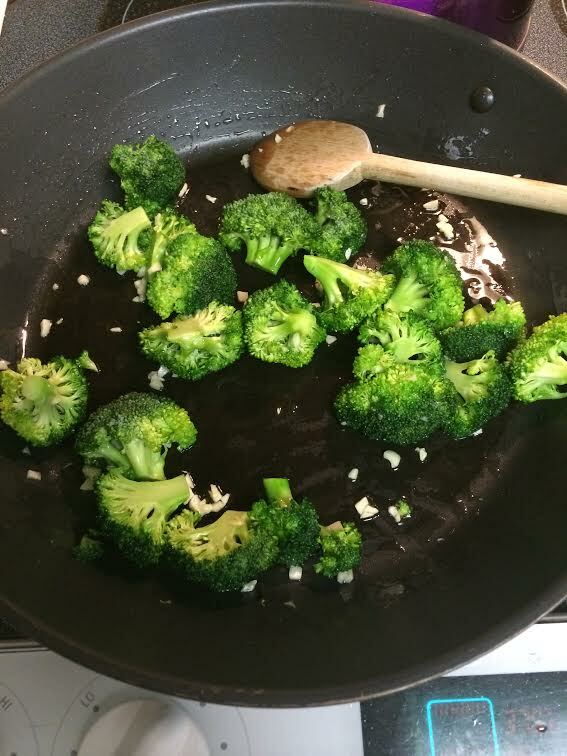 This was a new method of cooking broccoli for me and I really enjoyed it. I did change the recipe a tad because I though the garlic would burn if I cooked it first. Instead I cooked the broccoli first, then added the garlic, then the chicken broth. I cooked it down while the squash was baking. I loved this broccoli! It was SO good! The garlic was perfect and everything tasted so great. I baked the squash with olive oil, salt, pepper, and the no-salt Costco seasoning. Because of this I didn’t need to add salt and pepper to the broccoli. Michael baked two chicken breasts (just seasoned with salt and pepper) to go with the squash and that was a good call because the dinner is super low in calories. I chopped up the baked chicken and tossed the “noodles” with freshly grated parmesan cheese. Really, the calories in this dish come from the cheese I think. We split a chicken breast. The dinner itself is less than 400 calories total. It’s a super low calorie, super healthy dinner and I felt satisfied and full. I didn’t feel like I was deprived because it was low in calories. This is one of my favorite new recipes we’ve tried lately and I will be making this dish on a regular basis. It can be vegetarian, or with chicken and I think shrimp would also work really well with this recipe. I can’t wait to make it again! You are going to laugh. I always hated broccoli. Just the smell made me sick. That was until 6 months or so ago, when I realized how good it was roasted! Now, I’m going to attempt to make broccoli this way (sans squash) tonight alongside our cajun pork chops. Thanks for the inspiration! Wish me luck! Yeah! There were lots of veggies I thought I didn’t like and I prepared them in a different way and was floored. Like squash, I always hated it until a few years ago I gave it another try and it was great. And Brussels Sprouts are my favorite food and for a long time I thought I didn’t like them. Hope you like this new method! It was a winner! Thank you! Yay! So glad it was a good one for you. ok ok ok IT IS TIME FOR ME TO TRY, too. CARLA recently posted..Kelp: it’s what’s for dinner! 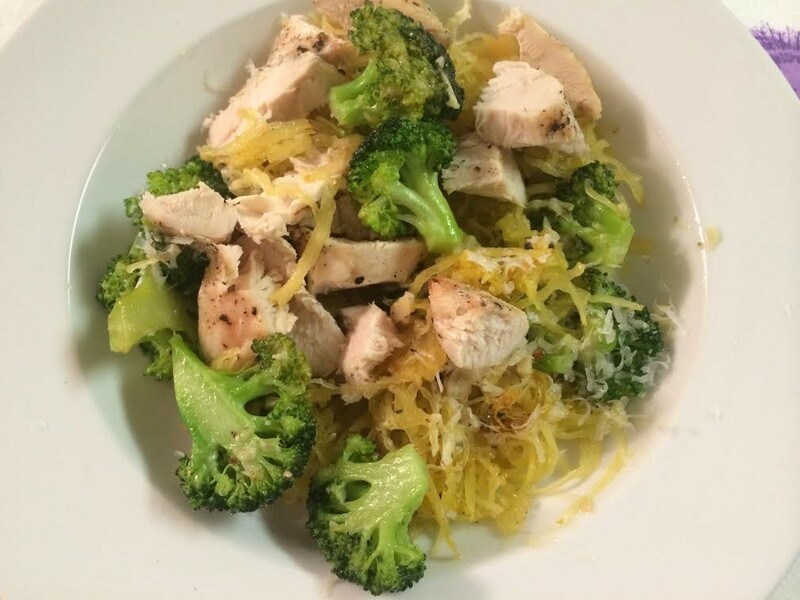 I love spaghetti squash in place of noodles and this recipe looks great!! Give it a try! It was fantastic! Excuse the extremely horrible photography in this link, but this was really good! I like the idea of doing a casserole. Thanks for the link! yay I’ve been way under-vegged lately. I’m going to make a LOT of this broccoli tonight, and we’ll see if I save any for tomorrow! Hope you like this recipe. I LOVED it!